A busy summer season, complete with great weather and a full slate of adventure activities, concluded at Camp Manitou on September 2nd. During the months of July and August a total of 430 Winnipeg Jets Hockey Academy students, 360 individual campers and 28 rental groups enjoyed the outdoor camp experience. Campers experienced a variety of activities that cover the 28 acres of grounds. 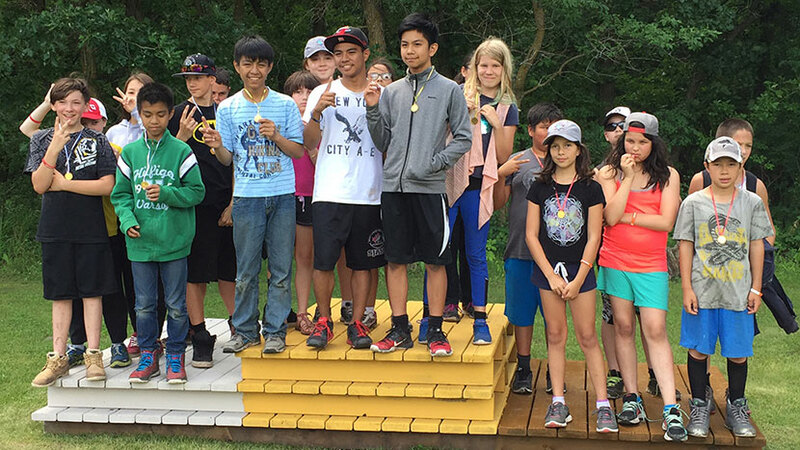 Fish and clams were caught in the Assiniboine River, the biking trails were well worn, the zip liners cruised over the forest, and campers were taught skills like how to build a campfire and navigate using a compass. Fridays featured Olympic themed campathon where campers competed against other countries (groups) in carnival games and a race around camp to reach the top of the podium! Looking ahead to the fall, there are 8 schools and 12 rental groups coming in the months of September and October. In addition, construction will continue on the cabins that are being built on the north end of the property and the Zamboni garage will be erected to facilitate the installation of ice this winter. The Travis Price Classic was held on August 15th and an amazing $220,000 was raised to assist in the upgrading of facilities at Camp Manitou! Thank you to the organizers, volunteers, golfers and sponsors for contributing to the immense success of this event!